Set just off Tuscany’s coast, Isola del Giglio (Giglio Island) has long attracted visitors to its idyllic beaches, quiet coves, and scenic hiking trails. The island, which covers 9 square miles (24 square kilometers), has three small towns and a serene countryside that offers respite from the crowds on the mainland. Located at the southern end of the Tuscan archipelago, Giglio Island is beloved for its rustic charm and sense of isolation. Ferries coming from the mainland arrive at Giglio Porto, while the walled village of Giglio Castello sits at the island’s highest point. On the far western end of the island, Giglio Campese is the most modern of the island villages. A dozen hiking trails wind through the hills, and along the coastline lie several inlets and small beaches, many only accessible by boat or on foot. 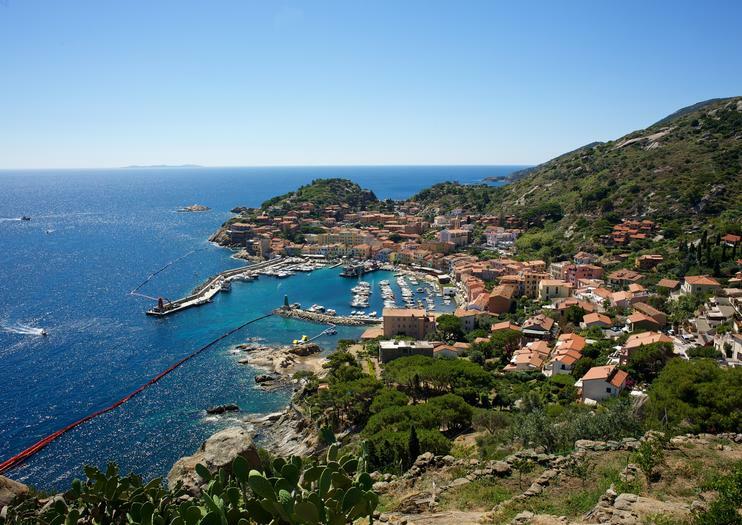 Day trips by ferry or private boat to Isola del Giglio are a fun break from the crowds of Tuscany’s popular Renaissance cities and towns and offer a chance to swim, hike, and explore independently. Boat tours may include beach towels and water-sports gear, but bring your own hat and sunblock. Some boats may be wheelchair accessible—always confirm ahead of time. Boat tours are family friendly; they’re a perfect way to spend the day with kids. If you plan to hike the island trails, be sure to wear sturdy footwear, a hat, and sunscreen and bring plenty of water. Part of the Tuscan archipelago, Giglio Island is located in the Tyrrhenian Sea, 10 miles (16 kilometers) off the Italian coast. Ferries bound for the island make the 1-hour trip from Porto Santo Stefano; you can also book a private boat tour. Due to choppy seas and inclement weather, ferry and boat crossings are often suspended in winter. The best time to visit Giglio Island is between April and October. Isola del Giglio is the second-largest island in Tuscan Archipelago National Park after Elba. The other five islands are Capraia, Montecristo, Pianosa, Giannutri, and Gorgona. In addition to the islands, Tuscan Archipelago National Park protects some beautiful dive sites, many just off the southwestern coast of Isola del Giglio. Leave bustling Rome behind for the day and immerse yourself in the almost-vanished world of the Etruscans, a pre-Roman people who inhabited a swath of central Italy just north of Rome called Tuscia. After getting picked up at your hotel, head to Tarquinia, a town northeast of Rome that boasts a large amount of fascinating Etruscan-era fresco-filled underground tombs. Explore the necropolis and then head to Cerveteri where you'll wander around a millennia-old necropolis inside a burial mound that is still crammed with ancient Etruscan artifacts. Learn about the history and culture of the Etruscans from the guide and head back to Rome with the knowledge and appreciation of a people historically important to Italy.